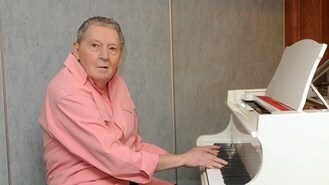 A member of rock'n'roll star Jerry Lee Lewis's band has been killed in a shootout in Memphis. Police said BB Cunningham Jr was working as a security guard at an apartment complex on Memphis's south-east side, when he heard a gunshot at the neighbouring Cherry Crest apartments and went to investigate, according to The Commercial Appeal newspaper. Police said when officers arrived, Cunningham and a 16-year-old boy were found dead from gunshot wounds. The teenager has not been identified. Cunningham's brother Bill - a founding member of 60s Memphis pop-soul band The Box Tops - confirmed his brother was killed. "He'd take care of the old people and the Spanish kids," Garcia said. "He was a good person. We don't feel good at this moment." Born Blake Baker Cunningham Jr, the keyboardist and singer established a national reputation in 1965 as a member of the touring version of Ronnie and the Daytonas, known for the song GTO. That band eventually became the Hombres, who scored a chart hit with Let It All Hang Out in 1967. After the Hombres' career slowed, Cunningham went to work behind the scenes at the famed Sounds of Memphis Studios. In 1971, he moved to Los Angeles where he served as chief engineer at Independent Recorders, working with the likes of Billy Joel, Elton John and Lou Rawls. Cunningham returned to Memphis a few years later and launched his own studio. He had been a member of Lewis's band since 1997. His solo album, Hangin' In, was released in 2003. Adele's Bond theme song has been beaten to the top of the official UK singles chart by Swedish House Mafia. Jennifer Hudson embodied the look of one of her idols, Whitney Houston, during a tribute to the late singer put on by Grammy organisers. Justin Bieber has revealed he's "happy" despite a Twitter user threatening to post footage from the pop star's stolen computer. Fleetwood Mac star Stevie Nicks has apologised for saying she would have strangled Nicki Minaj "to death" if she were Mariah Carey. The Rolling Stones are said to be in final negotiations to headline at Glastonbury 2013. Barbra Streisand was full of Brooklyn pride as she belted out well-known tunes during a concert at the newly built Barclays Centre. Lionel Richie has revealed he is "incredibly excited" to perform in the UK. Drugs and a gun were found on rapper Nelly's tour bus at a West Texas checkpoint where several celebrities have been arrested, US authorities have said. Scouting For Girls frontman Roy Stride says the band's new album has a more grown-up sound.